On the other hand, regular vanilla rotation has few planets. Segregated content means we can't have WA on Bespin alongside Hoth. It's in the loft. Behind the cupboard pole and the ladders. Would it be possible to retire the DLC maps into rotation for all players, let's say six months after release? Those who bought the DLC still have heroes and cards, those who want Nien Nunb (pbuh) can still buy it, and we all as a community get a more complete and integrated experience. Battlefront twelve months from now will have no segregated playlists, an exceptional wealth of maps and importantly, longevity. I think this is more important than jealously guarding the maps we got as part of our DLC purchases. It not only benefits the non-DLC holders but us too, I want to see a complete game. Thoughts? Either buy the DLC or don't. The only time DLC will be given away to the community is when this game is pretty much dead. Probably just prior to SWBF2 release. I paid for the DLC too, and you're probably right, but it's a really selfish mentality that thinks that way. It's not even a physical product, and noone is taking it away. We just want to be able to play the whole game as the whole game. As I've posted approximately 10 times in other threads, where I believe I started the notion, I agree with the OP's concept with minor exceptions. When each new DLC drops, the prior ones maps are folded into the main game. The weapons, cards, and anything else is still locked to those that didn't pay for it. No one is losing anything, and we ALL win. We're trying to be Charlie here people, not Veruca. Grow a soul. I suspect you did and I'm completely on board with it mate. Right now the game feels fractured. Just put default maps into the playlist with map vote or random system and it should be fine. I don't want to change servers to mix new and old maps and playing only the new ones gets old fast. Totally agree. As a season pass holder I also want them in the vanilla list. I would love this but I not a season pass holder so I am obviously going to say this. I disagree with your comment about it being selfish. If you pay for a product it is not selfish to want to keep that product and not give it away free for others to use. If you work hard to afford and buy something then you deserve to keep it. This is not being selfish. I also, conversely, agree that the DLC maps in main rotation would benefit us all. I just would not be happy with the high price I paid for the season pass equating to a handful of weapons and heroes. This would not be adequately valuable for the price paid and would be an insult to those that entered into the purchase contract with the product. I also feel that such a move would make it impossible for paid dlc to be available in the future, nobody would spend money on something that may eventually be free to all. I do, however, feel offended at being labelled as selfish for wanting to keep something that I paid a lot of hard earned cash for. Everything is worth less over time. This whole game will eventually be in a preowned bin for ten dollars and the season pass will go on sale. It's just the way of things, in a year what we paid for won't have the same value, and when that value is decreased, and we've all played the DLC maps to death for six whole months or more; why not move them to the base game to enhance our experience along with everyone else's? I couldn't agree more. I've only played Outer Rim a couple of times. Extraction is fun, but I wish I could play some of the other small game modes on the vanilla maps too. It'd be awesome if we can ALL enjoy the DLC maps and modes but us season pass holders can keep our weapons and cards. It would make the game more complete. Im fine with it too, as a season pass holder. I still believe they could do the dlc modes be running in its own playlist, and the modes that are empty, are empty for reasons and noone cares about, if they arent played. As i said give it away all for free, no problem, the better the game, the better for me. If i buy battlefront 2 i will wait the 6 month for the maps to be free again, no season pass needed. A simple way to fix the problem would be to keep the outer rim map and mode select screen. but remove rotation and add the maps in that support the modes. that way if someone wants to play cargo or droid run in 8v8 runs on Outer rim maps & vanilla maps all day they can. or 8v8 heroes vs villains they can. It would also be nice if they added the extraction game mode to the list of modes in the All modes selection screen. That's the problem. Nobody would buy future dlc knowing that it will become free so soon and dlc costs money to develop. There may not be any dlc with such a model. Exactly. If you get a game at launch you pay full price, if you get it by the time it becomes cheap/free then you probably haven't paid much for an old game anyway. I expect the DLC price will come down, and when it does, who'd argue with a few dollars for heroes? Season Pass holder and I fully agree. I understand the business model of DLC, but I think there's got to be a better way make it more inclusive. i would agree since you are going to refund my season pass cost. and any extra they charge if the season pass wont cover it. Original modes would be refreshed each DLC release with some new maps put into their rotations. These new maps would be free for all to play and have some DLC themes, encouraging more people to buy the DLC and play the exclusive DLC maps in the exclusive DLC mode. Still would also have all the DLC unlocks etc. If you don't have the DLC you can't play that specific exclusive mode or get access to the unlocks etc. Best solution for everyone and no Playlists, no community fracturing, older modes stay fresh. Boggles my mind. They had time to tweak Outer Rim to fit this model and then release Bespin this way, but no. It's amazing, really. The way it is now the older DLC modes are gonna die, no one likes the Playlist, the original modes don't get refreshed with new maps in their rotations (this is still the way I play the game - I don't play DLC Playlists). Makes me sad for the game really when a great solution was right in front of them. The game and DLC are already cheaper than what I paid. I'm not offended. Sales happen. It's the price I pay for my impatience. If the new game modes are attached to DLC only, we're getting modes, weapons, heroes, and early access. After DLC 4 they'll probably package it together in a cheap package anyway, but I will have been enjoying it for a lot longer and playing the modes I want. I will post on as many threads as possible so we can forward this idea to DICE to implement the DLC maps into vanilla rotation. I'm a season pass holder and I would love this idea so we can get rid of the playlist that most ppl complain about. Good! It would mend the split in the community the DLC maps are creating. That's actually the definition of selfish. Or at least a really good example of it. + 1 ! Good points! As pointed out, I completely forgot that apart from Heroes, weapons and cards, we'll also keep modes. So Extraction becomes it's own playlist like everyone wanted. Blast, HvV etc are all now in regular rotation. This idea keeps getting better. Thanks! I have been campaigning for this idea since I started playing the game a month ago, putting it forward in every single thread. I don't mess with Twitter too much - too much to follow lol. If someone wants to tweet Dennis about it, please do. It's a community developed idea. I'm a season pass holder and I'm all for this. I've hardly played outer rim because I tend to want to play one mode at a time. Also, no real reason they can't implement it now after the fact. It doesn't change the DLC much in any way. Just makes t totally better. I actually enjoy Outer Rim. And I'm a pass holder that is not in favor of giving away free what I paid for. As a season pass holder I support this idea. Add the new maps into rotation on the base game modes. This benefits everyone as I honestly rarely get to play the Blast, Cargo, and Droid Run modes on Outer Rim as they're stuck in a playlist with stuff I often don't feel like playing. - Exclusive play of new game modes, which is what the playlist icon can be turned into once the maps are added to the base game. For example, kill the Outer Rim playlist and add the Blast, Droid Run, etc, versions of the maps into the base game. Turn that icon into an Extraction Mode playlist instead now, available only to DLC owners. Once Death Star is released, kill the Besbin playlist and turn it into a Sabotage Mode playlist, available only to DLC owners. - Add in some other bonus content for DLC owners as you go to make up for it, like exclusive skins and additional maps for the DLC-only modes like Extraction and Sabotage. Even just the maps, half a year later? What we paid for pre-launch depreciates in value over time. Battlefield 4's on digital offer for about £4 at the moment and some of the DLC is now free. Surely Outer Rim's maps for HvV/Blast won't be worth coveting like Gollum by Autumn? so you'll be charging $50 for cards and weapons that I may not like and skins? No Dice. Pun intended. in 6 months we'll be readying for BF2. These servers will probably be closed then. If You're gonna give DLC for free after BF2 comes out then fine. I won't feel cheated. Actually it is an example of ownership. It is not selfish to expect something that you paid for to remain yours. Yes. I feel the same way! I would want my money back. AND I certainly would not pay for DLC that comes with EABF2. in 6 months we'll be readying for BF2. These servers will probably be closed then. Both of those points are wrong though, in six months DLC 4 will still be unreleased and BF2 a year away. 'I would want my money back' just sounds churlish. Unless you love forced playlists, we all win. I'm not in love with them but I don't see the point in giving something away because of the playlists. Overwatch isn't doing that and they have a playlist. If you want to give stuff away 3 months after DLC 4, Then fine. Otherwise they can refund everyone who paid for the extra content. Or add bots to fill out modes. Just me. Why should anyone have what I paid $50 for? Why should anyone have what I paid $50 for? Because it means you get a better game. You've got Greedo and Nunb, you've got Extraction, you've got the Scattergun and whatever else was exclusive, in perpetuity. You've played the maps exclusively for six months and then they get folded into your main game. 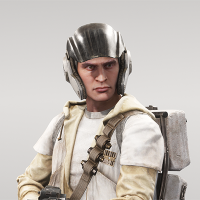 You go from Endor to Jabba's Palace in HvV, you go from Hoth to Bespin in Walker Assault. You and I get to go wreck in Extraction, but our vanilla game is more varied and more populated, it becomes the game it should be. The game is fine for me right now. $50 isn't worth heroes and skins. And if you gave the maps for free, people would want the heroes free too. When does it end? It would be nice if they gave everyone everything for free. But they didn't. You'd make suckers out of the people who paid. I have no issue going back and forth between the playlists. Just my opinion. For the people who disagree to the DLC maps being implemented into Vanilla then I can see 1 other option besides keeping the forced playlist and that`s a server browser. With a server brower we can have servers specifically for one game mode or a mix of them. The problem with this is that it doesn`t solve the population problem so eventually there wont be as many people playing a certain gamemode in a DLC pack. I figure the maps will be given away free anyway toward the end of the run before SWBF2 comes out. I have the season pass and to me the cost is more about getting to play it earlier, exclusive weapons, star cards, and modes to a point. I have no problem if the maps are put into rotation for everyone but if they would decide to do it, they would need a couple pretty sweet things to give the season pass holders. Another option that could possibly keep the season pass storm down if they did it is add maps to the original modes. So like a season pass holder who wants to play WA will see Bespin and it is unlocked. A person who isn't will see Bespin but it is locked and they purchase the map for $3.99 or something. Could do that with the modes also.